This season, the team hopes to continue its recent run of success. 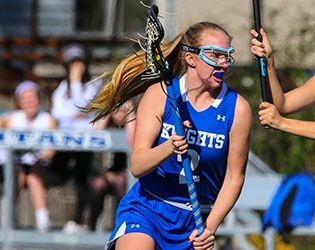 Last spring, the Knights graduated several key players who contributed to a two-year stretch that included 40 wins, two divisions titles, a Prep B Championship and a trip to the Non-Public B South Sectional Finals. This spring, the team will look to its ace pitcher, Muhlenberg-bound Cameron Miller (4-3 with a 2.45 ERA for the 2016 season). Miller is also expected to make contributions at the plate, as he finished out 2016 batting .360, with 32 hits and 33 RBIs. In addition, junior shortstop Ryan Morash (.418, 38 hits, 23 RBI) and sophomore catcher A.J. Donofrio (.338, 23 hits, 15 RBI) received division one interest in the off season, and they will help to lead Gill both offensively and defensively. Seniors Cameron Gateman and Jack McMahon will look to solidify the outfield, while juniors Scott Begane, Joe Johnson, and Anthony Lake are expected to contribute at infield positions. Senior righty Evan Druskin and sophomore lefty Mike Giammarino will make the move from the bullpen to the starting rotation, and senior Ryan Fucci will provide some outfield and pitching depth. Freshmen Jack Petraitis and Michael Taylor have been impressive in the pre-season and are expected to help the Knights on the mound and at the plate. Rounding out the squad are freshmen Andy Lutz, Gavin Morrison, Eddie McCarthy and Steve Vecchio. The boy’s tennis team is gearing up for another exciting season on the courts. Although the club does not have much experience at the varsity level, under the direction of head coach Ryan Carty, and anchored at first singles by junior co-captain Will Orazietti, the team looks to a strong season, with newcomers making an immediate impact on the program. Fostering a strong sense of teamwork will be key for the Knights this season. Co-captain, and lone senior, Jake Udoff (second singles), will provide the leadership and experience to galvanize the squad. Other key players are sophomores Will Henderlong and Dara Nourbakhsh, who have brought great energy and competitive spirit to practice. The first few weeks of practice have been promising and the team is excited for matches to start. The goals this season: compete for a conference championship; do well in the Prep B tournament; compete hard and improve on a daily basis. Due to lots of rain in early April, the team has garnered some extra practice time, as the first few matches of the season were rescheduled. The season opener is now slated for April 12, when the Knights will take on Franklin at home. In its second season as a varsity program, boys’ lacrosse is still a young team, relying on contributions from throughout the roster. Senior co-captain Nick Cooper will be a huge part of the team’s offense, having taken the lead in New Jersey for points (166) and for goals scored (94) during the 2016 season. Leading the defense will be senior co-captain, All Prep-B goalie, Will Dadouris. He will be supported by a solid group of young defensemen, including juniors Robert Haversat and Tyler Schrecengost, sophomore Christian Ernst and freshman Adrian Meyers-Massuet. Seniors Cam Burns and Lake Jacobson will continue their excellent work, leading by example and elevating the level of play. Jacobson and sophomore Clay Goulburn will be anchoring the midfield on both ends of the field. Off to a strong start, the Knights have defeated their first two opponents this season, besting Parsippany Hills 12-3 and Morris Catholic 17-8. This season, the Knights will be looking to the leadership of the team’s three captains: seniors Emma Dean, Katherine Lioudis and Jen Lowe. Other major contributors returning to the field include junior Amelia Kirby (last year’s lead scorer) and sophomore Andree Aloise. This varsity team is the biggest in girls’ lacrosse history with 25 players suiting up. Newcomers to the team expected to make significant contributions on the field include freshmen Lexi Yates and Lauren Garcia. The Knights are looking forward to making the team’s first year in the Skyland Conference a memorable one, with eight in-conference games on the schedule. The girls have a strong out-of-conference schedule as well, with key matchups against Blair, Mahwah, Pennington, North Brunswick and Governor Livingston. New head coach Meghan Cassidy looks to bring her program-building mindset to the team. Despite the loss of ace Emma Corbett, who graduated last spring, the Knights are anticipating a strong 2017 season. Senior Maddy Bedrock is more than ready to assume the role of starting pitcher and lead contributor in the box. Bedrock is one of for returning all-conference players this season, along with juniors Grace Beveridge, Claire Chestnutt and Dani Towle, who will be expected to make significant contributions. Although the Knights will not be participating in the Somerset County Tournament this season, they are eager and ready to work towards their third consecutive Prep B Championship and toward continued success in the Non-Public B South State tournament. In addition, the Knights are looking for a Mountain Division Conference championship repeat. Looking ahead, the Knights will prepare for key games against conference rivals Bound Brook and Mount St. Mary’s. Three of the team’s strongest defensive players—Bedrock on the mound, Towle controlling the infield and Beveridge leading the outfield—will also be key contributors in the box. At the plate, Chestnutt is expected to have a breakout year as catcher, while contributions from seniors Emily Supron, Genny Fischer and Carolyn Brand will be key. Freshman Kerry Colford is expected to make an immediate impact on the field, as will returning juniors Alex Delehanty and Nour Marzouk. On the boys’ side, key returners to the team include senior Matt Petit, who runs the 800m and 1600m and will be vying for state recognition. Junior long distance runner Bobby D’Angelo (1600m and 3200m) will be looking to step up to the next level this season. Junior C.J Licata, who placed third in the state this past winter in the shot put and won five championships, will represent the team in shotput and discuss. In addition, freshman Niels Rongen (1600m) has a high ceiling for success. The girls’ team is led by senior Erica Phiansunthon, who has the presence to build on her success this winter in the shotput, discus and javelin. In the 1600m, the team will look to veteran runners, senior Sammy Bittman and junior Lily Fischer. Junior Nicole Johnson has a chance to do big things in the 800m and 400m this season. Newcomers, freshmen Sam Lowe at the 200m and Anna Mikula in the javelin, look to extend Gill’s excellence. Key meets this season include the Skyland Conference Relays, the Somerset County Relays, the Prep B Championship on April 22 and the sectional meet of the Non-Public Group B on April 26-27. The golf team is looking forward to a strong season under the direction of head coach Mike Cascini. The team will be led by seniors Tristan Kaminski, Troy Pilla, Christian St. Germaine and Graham and Grayson Valentine. Another key contributor will be returning sophomore Abhay Puri. Freshmen Nick Policano, Drew Kramer, and Evan Varma will be looking to make an immediate positive impact for the varsity team. The team has set its sights on winning the Mountain Division of the Skyland Conference and qualifying for the state tournament, at both the team and individual levels. The team recently traveled to Pinehurst, North Carolina, for spring training, where they were able to practice and play at a number of world-class golf courses. Stay tuned for an exciting season of spring sports. Go Knights!